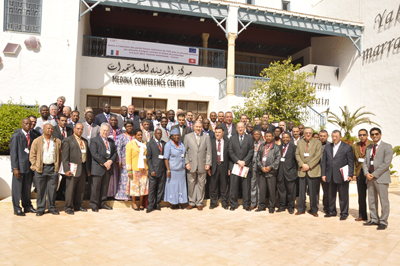 About 60 participants representing forty countries in Africa and the Middle East participated in a workshop for OIE National Focal Points for Animal Production Food Safety in Hammamet, Tunisia,from 4 to 6th of April 2011. This workshop, organized under the joint OIE project / European Commission 'Better Training for Safer Food-Africa' (BTSF Africa) and co-financed by the European Commission and Italy addressed the role of OIE National Focal Points for Animal Production Food Safety in the production phase. OIE focal points are placed under the authority of the OIE Delegate of each member country and support them to carry out and implement the duties and obligations inherent with the status of OIE member countries. In terms of food safety, this includes the establishment of a network of animal production food safety experts within the country or to communicate with the existing network (consultation with recognised experts on draft texts or draft standards proposed by the OIE Code Commission, dealing with animal production food safety issues). Organized by the Sub-Regional Representation of the OIE for North Africa based in Tunis in partnership with the OIE Regional Representation for the Middle East, the workshop also served to remind participants of the role of Veterinary Services in the area of food safety and in the establishment of intervention strategies for monitoring and control of Salmonella and Campylobacter or control programmes against Echinococcus, Trichinella and Cysticercosis in the countries of the regions. The support offered by the OIE in terms of capacity building of Veterinary Services (OIE-PVS tool or OIE twinning for example) has also been presented and discussed with participants. During his speech, the Minister of Agriculture and Environment of Tunisia, Mr. Mokhtar Jellali said that improving food security in Africa and the Middle East is a key public health issue and efforts must be increased (based on OIE standards) given the major social and economic impact of diseases potentially transmitted by food.